THE CARILLON IS PLAYED BY A SILENT AND MASKED “SPIRIT OF THE BELLS” THAT APPEARS ONLY TO BREATHE LIFE INTO THE INSTRUMENT FOR THE PERFORMANCE. THE “SPIRIT” AND CREATOR OF CAST IN BRONZE, FRANK DELLA PENNA, BEGAN HIS STUDIES IN VALLEY FORGE, PA, AND IS A GRADUATE OF THE FRENCH CARILLON SCHOOL IN TOURCOING, FRANCE. CAST IN BRONZE HAS BEEN INVITED TO PERFORM FOR BOTH POPE JOHN PAUL II AND THE PRESIDENTIAL INAUGURATION, AND HAS PERFORMED AT WALT DISNEY WORLD’S EPCOT IN ORLANDO, FLORIDA 1998 – 2003 FOR THE CHRISTMAS SEASON. THE MUSIC OF CAST IN BRONZE HAS ALSO BEEN HEARD ON RADIO, AT MUSIC AND RENAISSANCE FESTIVALS, ON TELEVISION INCLUDING A SPECIAL CHRISTMAS EVE PERFORMANCE ON THE NBC “TODAY” SHOW, AND AT ALICE COOPER’S 2004 “CHRISTMAS PUDDING” BENEFIT CONCERT. THE CARILLONS OF CAST IN BRONZE CONSISTS OF 35 BELLS EACH WITH A TOTAL WEIGHT OF FOUR TONS EACH. CAST IN BRONZE IS THE ONLY MUSICAL ACT OF ITS KIND IN THE WORLD, AND FEATURES THE ONLY TWO CARILLONS IN HISTORY SOLELY SUPPORTED BY LISTENERS. 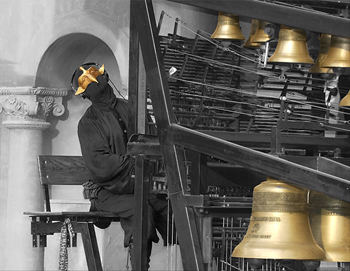 FIVE CENTURIES AGO, A MUSICAL INSTRUMENT OF CAST BRONZE BELLS WAS CREATED AND BECAME KNOWN AS THE CARILLON. IT IS PLAYED FROM A MODIFIED KEYBOARD WITH THE FISTS AND FEET. LOCATED IN LOFTY BELL TOWERS THROUGHOUT THE WORLD, THE INSTRUMENT AND ITS PLAYER WERE HIDDEN FROM SIGHT, MAKING THE CARILLON ONE OF THE WORLD’S BEST KEPT SECRETS. THE CARILLON WAS CREATED IN FLANDERS (AN AREA OF NORTHERN EUROPE NOW OCCUPIED BY THE NETHERLANDS, BELGIUM AND NORTHERN FRANCE) ABOUT FIVE CENTURIES AGO TO PROVIDE A MUSICAL VOICE TO BELL TOWERS TO RAISE THE SPIRITS OF THE RESIDENTS. THE BELLS (23 OR MORE) ARE HUNG IN A STATIONARY MANNER AND THE CLAPPERS ARE CONNECTED TO A MECHANICAL KEYBOARD PLAYED WITH FISTS AND FEET. CARILLON PLAYING REQUIRES MUSICAL DEXTERITY, STRENGTH AND ENDURANCE. CAST IN BRONZE IS THE FIRST TRANSPORTABLE CARILLON IN THE U.S. AND THE ONLY FULL TIME MUSICAL ACT IN THE WORLD WHICH FEATURES THE CARILLON. 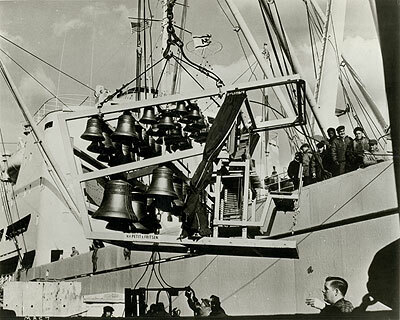 IN THE MID 1960'S, 35 BRONZE BELLS WERE PLACED ON A MOBILE CARILLON FRAME BY A DUTCH BELL FOUNDRY AND SENT TO AMERICA. FOR THE FIRST TIME IN HISTORY, THE RARELY-SEEN EUROPEAN ART OF CARILLON PLAYING COULD BE BROUGHT TO AUDIENCES. EVENTUALLY, THIS CARILLON WAS PURCHASED IN 1991 BY A GENTLEMAN WHO CHOOSES TO REMAIN ANONYMOUS AND GIVEN NEW LIFE BY FRANK DELLAPENNA, MASTER-CARILLONNEUR GRADUATE OF THE FRENCH CARILLON SCHOOL. DELLAPENNA'S LIFE-LONG DREAM OF SHARING THE BEAUTY OF THE CARILLON BY COMBINING IT WITH OTHER MUSICAL INSTRUMENTS COULD FINALLY BE ACCOMPLISHED. TODAY, MANY CARILLONS HAVE FALLEN INTO DISREPAIR OR ARE SIMPLY NO LONGER PLAYED BECAUSE OF LACK OF FUNDING OR INTEREST. THOSE CARILLONS THAT CAN STILL BE HEARD ARE ALL FUNDED BY GOVERNMENT AGENCIES, INSTITUTIONS OR THROUGH AN ENDOWMENT FUND PROVIDED BY A GENEROUS BENEFACTOR. CAST IN BRONZE IS THE ONLY MUSICAL ACT IN HISTORY UTILIZING THE CARILLON THAT SUSTAINS ITSELF SOLELY BY LIVE PERFORMANCES AND RECORDING SALES. IT RECEIVES NO FINANCIAL ASSISTANCE FROM ANY OTHER SOURCE. THE CREATOR OF CAST IN BRONZE HOPES THAT HIS ONE MAN CRUSADE WILL PRESERVE AN INSTRUMENT AND ART FORM FOR FUTURE GENERATIONS.